Do you get frustrated over the expense to purchase Oki B6500 toner cartridges at present? We have a lower price guarantee so our toner cartridges for the Oki B6500 laser printer are astonishingly affordable. Moreover, we strictly test and validate every single Oki B6500 cartridge to make sure you'll get total customer satisfaction. It's time to leave behind spending high street pricing because we can offer you a less pricey option. Settling for a bad quality Oki B6500 toner isn't ever beneficial to you or your Oki printer. Thanks to our no quibble money back guarantee on toner you'll never need to take any risks. Here at Cartridge Save we're dedicated to reduce your expenditure without having to sacrifice on print quality and results. Buy now at Cartridge Save and start saving. Small to medium-sized workgroups looking to improve their productivity and performance can consider the Oki B6500 mono laser printer for its fast print speeds, low running costs, and efficient document handling features. The B6500 A4 mono LED printer is highly secure and versatile enough to perform the most demanding jobs, but upgrading it is expensive. The Oki B6500 printer features an understated yet boxy frame with the 700-sheet standard paper trays and an output bin. It is quite bulky and heavy, but additional paper trays can be integrated conveniently at the base, so the printer does not require additional installation space when upgraded. The B6500 LED laser printer runs on 128MB of standard RAM and a 533MHz processor. There is a small display screen on top, which is slightly angled for comfortably viewing. The standard interfaces include parallel and USB 2.0. The Oki B6500 monochrome laser printer is fast, with speeds of up to 45ppm. The paper capacity can be increased to 1,800 sheets with additional installations, and the memory can be upgraded to 640MB. A generous duty cycle of up to 200,000 pages per month ensures high productivity. The versatile Oki B6500 can print text documents and simple graphics sharply in 1200x1200dpi. Printing with a high capacity Oki B6500 toner can help to reduce the operating costs. 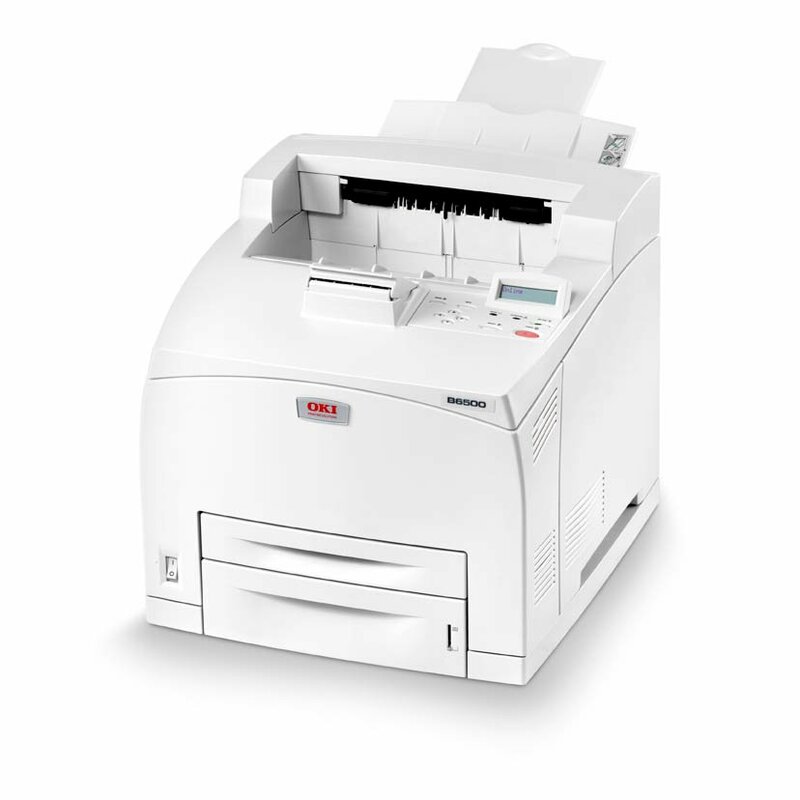 The absence of colour printing could prevent the Oki B6500 from being useful in creative workgroups. It can be expensive to increase the paper capacity and the built-in memory. There is an option to integrate a 40GB hard disk drive into the Oki B-6500, but that means spending more money for this already expensive printer. Two-sided printing and Ethernet connectivity are optional for the B6500.